The Easter Toy Egg Painting Set makes the Easter tradition of decorating Easter eggs fun for the whole family. This set is absolutely perfect for an Easter egg decorating party. Everyone will be able to make the Easter eggs of their dreams with all of the supplies and decorations in this set, and you'll end up with more than enough pretty and colorful eggs to fill all of your Easter baskets. Material: Made of high-quality wood. Perfectly safe for craft-making sessions at home or in the classroom. Excellent Quality: These wooden eggs have been smoothed down to the point of having no splinters. Their surfaces are easy to draw, paint, or put glue on. Wide application: Kids can do many projects with these wooden eggs! 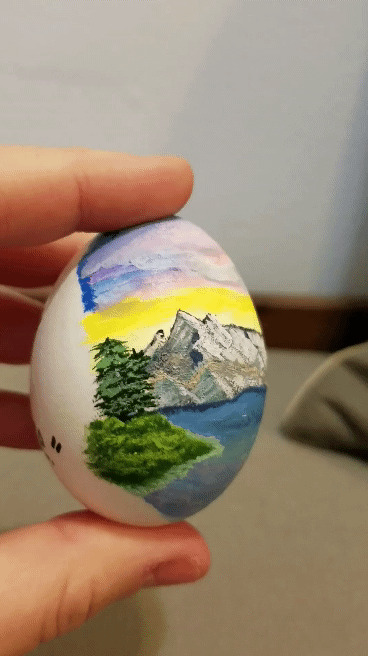 You can use them to make personalized Easter eggs, charming home and kitchen decorations, and store displays, or simply paint them with various colors to make eye-catching embellishments! Very cool product and my daughter love to play with this egg so much . Would love to buy it again in future. Perfect for little hands. My son is almost 2 years now and they are a great size for him. I like that there is a variety of colors. I loved this! The size is good for kids hands, not too big, not too small. And it all main colorful color. Loved this! So cute. Fits perfectly in my 2 years old hands. Colors are great too that’s why my son loved this product so much, will be ordering more soon. Thank you so much for this! Super fun, easy for a toddler to hold, and colors are great and work well on paper. Nothing more I could ask for! These are so cool! I can’t wait to do these with my niece! So far, I'm loving this product cause of the quality. Thanks! They were pretty and blended in with a set I had bought with sayings on them. I LOVE THIS PRODUCT SO MUCH! I accidentally ordered these instead of chalk eggs. However, these worked out so nice for our Easter egg hunt. We did not even have to paint them but we are so happy to have these eggs! These wooden eggs are the same size as some real or plastic eggs and can be used for Easter basket decoration or placed inside egg cups. They will not break but can be scratched etc. I wish they had more colors and sold them in a set of 10 but still very happy with my purchase. Thank you.